Our company, Northwind, Inc., recently had to replace an existing turbidity curtain for control of suspended silt on the Weekly Bayou near Eglin Air Force Base in Florida. The existing floating silt curtain was not functional anymore, and we searched for a resource that could guide us to the correct silt control product and GEI Works' turbidity curtains fit the bill. We explained the situation, and their technical sales staff provided an accurate assessment. It was a pleasure to work with their team. We did not have any issues with silt migration and stayed well within the project scope. The picture is of the turbidity barrier supplied by GEI Works and it clearly shows how well this turbidity curtain repair works. 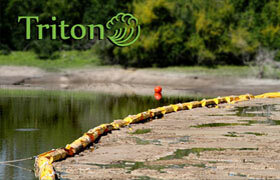 Floating Silt Curtain is an excellent choice for controlling suspending silt. Once installed in your location, curtains work to contain turbidity and silt to a specific area. By keeping the silt in one place and preventing it from spreading, turbidity curtains contain potential pollution to the site and help reduce settling times along the barrier. Most turbidity curtains are made from robust materials and can be deployed for extended periods of time, depending on the type of curtain used. However, they are not everlasting. If you are working with a barrier that is no longer functioning correctly (such as the customer testimonial above), please consider purchasing a new silt curtain. Having these barriers functioning at their top ability is the only way to ensure that silt and sediment are properly contained. When looking for turbidity curtain repair or replacement options, also consider the unit as a whole. Turbidity curtains generally come in sections of 25, 50, or 100 feet, so one project often features several sections connected together to form a required length. If only one section of the barrier is in need of repair, options may include replacing only one section or using our Vinyl Repair Kit to patch any small rips or tears. Please feel free to contact us for additional information regarding turbidity curtains and how they can be used in your location. If you'd like to read more testimonials from satisfied GEI Works clients, please visit our Customer Testimonial Overview page. Questions about turbidity curtain repair? We can help! Call our team at +1-772-646-0597 or fill out our quote request form to discuss your requirements.